I think I realize the one of the root causes of my earlier cello distress. It’s something that all adult beginners face. It is always right in front of us, but sometimes we choose not to see it. The problem is ambition. Hundreds of us have written about it, and just about every adult who started an instrument late in life has dealt with it. I thought, for some reason, that I was above that. That I would be patient with myself and realize that adult learning is still a slow process, and all those nice words. 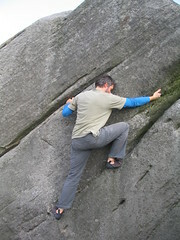 However, as I have been progressing up the rock, gaining new technique as I go, I also became ambitious. Suddenly, I realize I could be good. I can start dreaming about actually playing my favorite pieces and thinking about musicianship instead of note reading. Real soon, my head will peer over that boulder and see the horizon ahead. So, now, I am comparing my playing to an ideal instead of to realistic milestones. Somebody said “all unhappiness is by comparison”. My recent distress has been to compare myself to unrealistic standards. My body is doing well for playing cello for two years, but it’s been just two years, so keep that in perspective. There has also been a solid discussion of practicing psychology that I will cover in the next day or so. That’s why listening to my recordings is so difficult. But when i stop comparing to the professional recordings I’ve heard in my head, and listen critically to myself, I can isolate what I don’t like about the sound (intonation, tone, dynamics) and experiment with different techniques to make improvements. But it is SO hard to not compare!! !